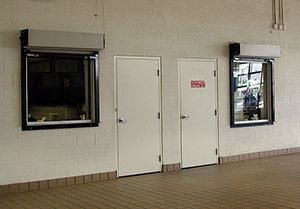 Counter Fire Doors can be provided with an S-Label as air leakage rated "Smoke Door" assemblies. Stainless Steel Sills (labeled counter tops) are also available. 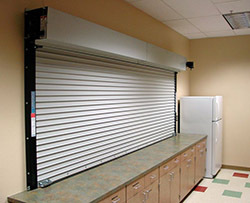 Commercial Doors Direct offers a wide array of rolling steel doors to meet the most demanding fire safety standards, unusual opening sizes and discerning aesthetic requirements. 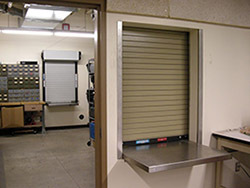 Designed to close automatically in the event of a fire or alarmed event, our fire-rated doors are available for service door and counter applications in commercial, industrial, institutional and retail projects. 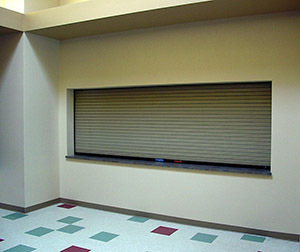 All doors comply with NFPA-80, and are listed for both masonry and non-masonry applications. Our Fire Doors offers fire protetion, innovative design, and optimized performance for the end user. The Fire Sentinel® time-delay release device provides an added measure of safety to control the doors' closure.